Whether you are a fan of night markets, a designer clothes enthusiast, or a technology buff, Hong Kong can surely supply your every want. On the island itself the main shopping districts are Admiralty, Central and Soho; Causeway Bay, known as the Olympic games of shopping; and the chic Sheung Wan. In Kowloon, Tsim sha Tsui is like a giant bazaar; the residential districts of Kowloon East and Kowloon West offer a number of shopping malls; and Mong Kok is where you can buy virtually anything. If you are looking for a bargain, head for Lantau in the New Territories, where there are a lot of outlet shops. But the old idea that you can get anything at the price you want in Hong Kong is no longer true: while trying to bargain in independent shops may still get you a bit of a discount, in chain stores and international designer shops the price is fixed and it is no use expecting the sales assistant to reduce it. The best value goods to buy in Hong Kong are cameras and electronic items, luggage, jewellery and men’s suits. As in some other parts of the world, it is still the case that you can get a tailor-made suit in the space of one day or even over night. The currency in Hong Kong is the HK Dollar, which is about 7.8 to the US Dollar, or 11.4 to the UK Pound, or 8.7 to the Euro. 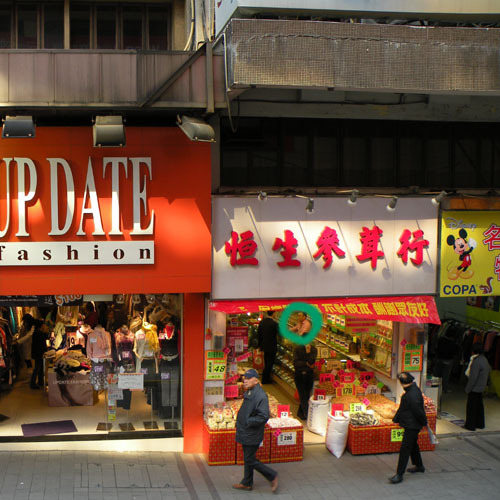 The photo of typically colourful Hong Kong shops with bright lights and their goods on the pavement is another image in our photo-comparison game, where we invite you to see if you can find all the differences – just for fun, of course ………. like shopping in Hong Kong!